Published: Dec. 26, 2011 at 10:53 p.m.
NEW ORLEANS -- Drew Brees has broken the NFL record for yards passing in a season, surpassing a mark that had stood since Dan Marino set it in 1984. 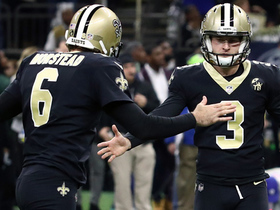 Brees topped Marino's record of 5,084 yards with a 9-yard touchdown pass to Darren Sproles in Monday night's 45-16 win against the Atlanta Falcons. 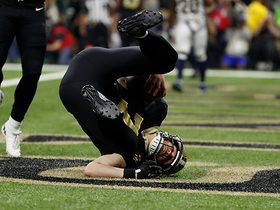 "Honestly, I was really trying not to think about the record or anything," Brees said. "I knew we were close. A couple guys mentioned stuff to me on the sideline. I didn't want to hear it. It's like a pitcher with a no-hitter, I guess." 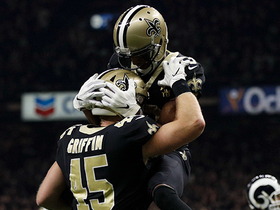 As Sproles spiked the ball, Brees thrust his fist triumphantly in the air and started walking toward midfield while the Superdome crowd went wild and his teammates chased him down. 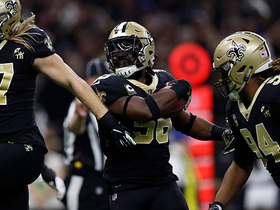 Offensive lineman Carl Nicks was the first one to get there and tried to lift Brees onto his shoulder, but couldn't do it as teammates swarmed around. "If I could have put him on my shoulders and paraded him around the whole stadium I would have done that. He deserves it," Nicks said. "It's like a movie, man. Just a movie ending. It's beautiful. ... You could tell by everyone's reaction after he did it how much people care about that guy. We all love him." Marino tweeted following the record-setting play: "Congrats to @drewbrees. Great job by such a special player." Brees entered the game with 4,780 yards, needing 305 to set the record. He has passed for 300 yards or more an NFL-record 12 times this season -- with one game still to play. This was his sixth consecutive 200-yard game, which ties an NFL record also shared by Steve Young, Kurt Warner and Rich Gannon. Brees threatened Marino's record once before in 2008, when he finished with 5,069 yards, making him and Marino the only quarterbacks to pass for 5,000 yards in a season.